The first serious attempt to manufacture porcelains in Istanbul was made in 1845 by Ahmet Fethi Paşa, whose efforts resulted in the establishment of a tile factory at Beykoz (a village outside Istanbul on the Asian shore of the Bosphorus) in which were employed potters who had been recruited from small independent workshops in the districts of Eyüp, Balat, and Beykoz. In addition to wall tiles, this factory also turned out dishes, pitchers, bowls, covered deep dishes, and other articles for everyday use. Examples of such wares having a white ground are decorated with the large, colored floral designs that were then popular in European porcelains. In some cases, the flowers are also gilded. The lids of pitchers and dishes have knobs shaped like flowers, fruits, and vegetables. Another group of white plates and dishes have a ground color that verges on cream. Plates are sometimes decorated with basket-weave patterns and with open,work designs; lids are decorated with raised flowers. The production of this factory is easily identified thanks to a stamp that was placed on the bottoms of objects. This impressed seal, consisting of the words Eser-i istanbul ("Istanbul ware") in the old script, is executed in black, green, red, or blue and may or may not be framed by an ellipse. Confronted by financial difficulties and poor maintenance, the factory managed to survive only 20-30 years before it was forced to shut down. The second serious attempt to satisfy the empire's demand for poreelains by means of local production was the establishment of a porcelain factory within the outer gardens of Yıldız Sarayi by order of Sultan Abdülhamid 11 in 1892. Known as "Yıldız Çini Fabrikasi the factory was originally intended to supply porcelains for the palace and court. The first porcelains to come out of the Yıldız factory were large decorative vases, dishes, and plaques. These were decorated with portraits of sultans and with panoramic views of Istanbul, most of which bear the artist's signature. 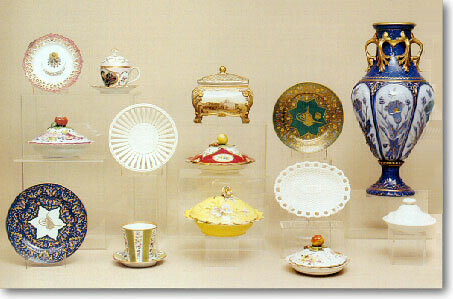 Articles for everyday use such as dishes, plates, pudding-decanters, and covered dessert bowls were also manufactured. These wares were modelled on European porcelains manufactured for the Ottoman market and are decorated inside and out with bouquets of colored flowers in keeping with Turkish tastes. Gilding is much in evidence. Knobs are shaped like roses, fruits, and vegetables. The rughra (imperial monogram) or initials of the reigning sultan usually appears on coffeeciips and saucers. On the backs or bottoms of Yıldız porcelains is a stamp consisting of a star-and-crescent and the last two digits of the year in which the piece was manufactured. You can visit the TCF Who's Who website to read porcelain artists' profiles.